The current campaign we're playing is an evil campaign. Though we've played campaigns where some of the players have had evil-aligned characters, the goals were always your fairly usual save the world heroic business. This is the first campaign we've played where we're terrible characters doing terrible thing. The campaign is that we're initiates into an assassins' guild. It's meant to be a mission-based episodic thing rather than an outright full-blown story (for now? Maybe the DMs have something planned for later). There's definitely some Assassin's Creed and Dishonored vibe to it, especially the latter, since it takes place more in a Renaissance-y setting rather than an outright Medieval one. Our missions are supposed to have an investigative, social and stealthy element to it as we scope out our targets rather than just charging in and killing. Which is fairly unusual for a fairly hack and slashy game. Needless to say, we goofed up pretty bad on our first mission (we were trying to kill a mob moss). Not enough reconnaissance coupled with bad rolls (several 1s came up when making especially important sneak attacks and subsequent attempts to escape). Let's hope the next one goes better. Renata is an actress fallen on hard times. Maybe back in the day in some other city she was well-known, but her haughty attitude and desire to live the high life have left her a bit desperate for cash. Renata is designed to be an infiltrator rather than an outright killer (she's not going to get her hands and clothes bloody, ew), though still with a sociopathic bent. If assassins are going to kill someone, she may as well get in on the action. Sophisticated dinners and fancy clothes aren't just gonna buy themselves. I also wanted to make a vaguely bardy character without actually making a bard. I wanted to focus on magically influencing others through enchantments and fooling others with illusions. I ended up going for the Rakshasa bloodline for Sorcerer, for bonuses to Bluff and bonus mind-reading. Shaedlings are to pixies what drow are to elves. When back when those elves who would become drow split away to follow Lolth the Queen of the Demonweb Pits, so did some pixies, and they too got "blessings" for their loyalty. Fey being closer to the primality of nature, Lolth's gifts are closer to her spidery nature. 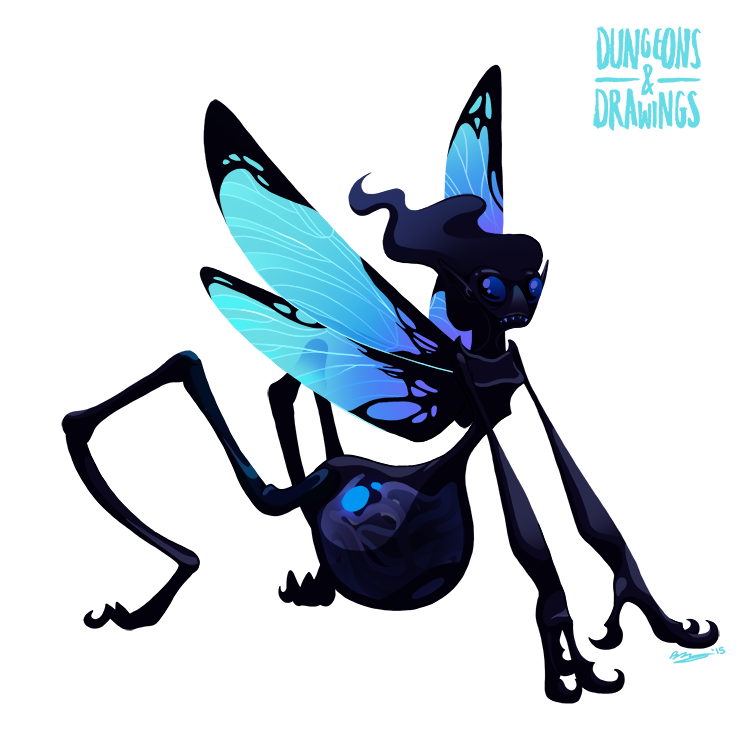 A shaedling is much larger than a pixie, who never break the three-foot mark, and are almost as tall as humans when standing straight. Their stomachs are grotesquely distended and filled with silk made of shadow-stuff, called shadow gossamer. The gossamer are is drawn and quickly woven into a small object, normally a weapon or armour, which is of extreme lightness and masterful craftwork. These objects are inherently linked to the shaedling, and will dissolve after a few seconds upon being relinquished. This was interesting to draw, though I found it a bit difficult to pose the shaedling in a way that was dynamic. It still isn't dynamic, but I like it more now than I did when I first started sketching it. I don't much care for drawing wings, despite how many of the things I've done have them (it is a standard fantasy trait). I did enjoy trying to figure out a way to draw the patterns on a dragonfly wing in a way that wouldn't overcomplicate the image.